[182 Pages Report] The overall superdisintegrants market is expected to grow from USD 341.1 million in 2017 to USD 536.5 million by 2023, at a CAGR of 7.9% during the forecast period of 2018 to 2023. Excipients are integral nontherapeutic substances used for the designing and development of drugs from active molecules which cannot be administered in the pure form. The use of excipients helps achieve better patient compliance, dose accuracy, and consistency. Superdisintegrants play an important role in reducing the disintegration time of oral solid dosage forms such as tablets and capsules, thereby improving their efficiency. Due to this advantage of superdisintegrants, these are heavily used during the formation of orally or fast disintegrating oral formulations, which, in turn, propel the growth of this market. These superdisintegrants are being used in various oral dosage forms which are further used in the treatment of neurological diseases, gastrointestinal disease, oncology, inflammatory diseases, infectious diseases, cardiovascular diseases, and hematological diseases. The base year considered for the study is 2017, and the forecast has been provided for the period between 2018 and 2023. Neurological or neurodegenerative diseases are a heterogeneous group of disorders characterized by the progressive degeneration of the structure and function of the CNS or peripheral nervous system. The WHO (2018) reported that various types of neurological disorders affect millions of people around the world, including 24 million that suffer from Alzheimer’s disease and 326 million experience migraines. According to a global study conducted by the WHO, 8 out of 10 disorders in the 3 highest disability classes are neurological. According to the WHO, neurological disorders are one of the leading causes of mortality, accounting for 11.84% of the total deaths globally, in 2015; this number is estimated to increase to 12.22% by 2030. This increasing burden of neurological disorders resulted into increasing demand for the effective and innovative therapies for the treatment of neurological diseases. In order to cater this demand, there is high usage of superdisintegrants in the formulation of orally disintegrating tablets (ODTs) for antidepressants, antipsychotics, antimigraine, and sedatives used in the treatment of neurological conditions is observed in the recent years, which, in turns, drive the growth of this market. The superdisintegrants market comprises a network of players involved in the research and product development; raw material supply; manufacturing; distribution and sale. 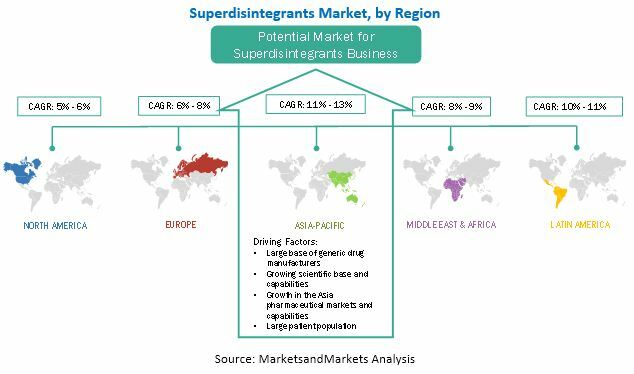 Key players considered in the analysis of the superdisintegrants market are BASF SE (Germany), Ashland Global Holdings Inc. (US), Dowdupont Inc. (US), Roquette Freres (France), DFE Pharma (Germany), JRS Pharma (Germany), Asahi Kasei Corporation (Japan), Merck KGAA (Germany), and Corel Pharma Chem (India). In March 2017, BASF Group opened the ‘Innovation Campus Asia Pacific’ in India. The company invested USD 61.6 million (EUR 50 million) in this center to increase its global and regional research activities. In September 2017, the Dow Chemical Company (US) merged with DuPont (US). The combined entity will operate as a holding company under the name DowDuPont. In September 2017, Roquette acquired Itacel, the excipient division of Blanver in Brazil. This will aid the expansion of Roquette’s pharmaceutical excipients business in the Latin American and North American region due to Itacel’s market position in these regions. In October 2016, Ashland opened a new pharmaceutical excipient facility in Nanjing, China, to produce excipients for the Asian market. What are the new technologies which the superdisintegrant manufacturers are exploring for the development of the special blends of the superdisintegrants? Geographically, the global superdisintegrants market is segmented into North America, Europe, Asia Pacific, Latin America, and the Middle East & Africa. In 2017, Europe accounted for the largest share of the superdisintegrants market, followed by North America and Asia Pacific. 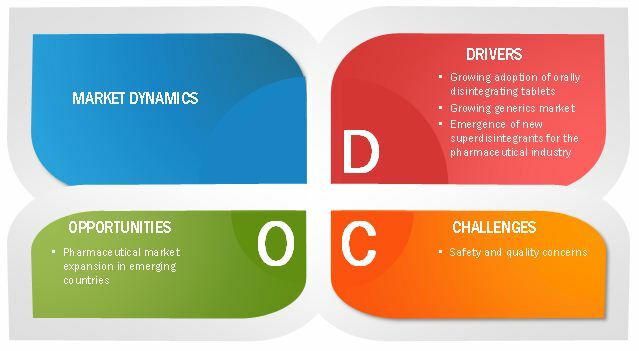 The dominance of the European region can be attributed to the presence of a number of pharmaceutical giants with large production capacities leading to extensive consumption of excipients. The growing emphasis on superior pharmaceutical products and generics is also expected to aid the market growth in the region. In 2017, neurological diseases dominated the superdisintegrants market, by therapeutic area. Neurological or neurodegenerative diseases are a heterogeneous group of disorders characterized by the progressive degeneration of the structure and function of the CNS or peripheral nervous system. The WHO (2018) reported that various types of neurological disorders affect millions of people around the world, including 24 million that suffer from Alzheimer’s disease and 326 million experience migraines. Also, according to PhRMA (2018), nearly 100 million individuals have been affected by some kind of neurological disorder in the US alone. According to a global study conducted by the WHO, 8 out of 10 disorders in the 3 highest disability classes are neurological. According to the WHO, neurological disorders are one of the leading causes of mortality, accounting for 11.84% of the total deaths globally, in 2015; this number is estimated to increase to 12.22% by 2030. As per the International Foundation for Functional Gastrointestinal Disorders, one in every four people in the US suffers from functional GI disorders, with symptoms such as nausea, vomiting, abdominal pain, decreased appetite, early satiety, bloating, swallowing difficulties, and heartburn and/or incontinence. It also states that GI diseases are also becoming common in the developing APAC region, with GERD, IBD, and ulcerative colitis (UC) being the most common. ODTs with superdisintegrants find high applications in GI disease treatment. The use of superdisintegrants in oral solid formulations for GI diseases have helped overcome problems such as impaired or delayed absorption of APIs in patients suffering from severe gastroparesis and other GI disorders, nausea and vomiting during drug administration, and the difficulty of swallowing in patients with dysphagia. More rapid and high absorption of drugs from the pre-gastric parts of the GI tract improves the bioavailability and efficacy of the drug. Owing to this, the demand for superdisintegrants in this area is expected to increase. What are all the developments taking place in the superdisintegrants market in coming years? What are the major therapeutic areas, which are targeted by the superdisintegrants manufacturers? The prominent players in the global superdisintegrants market are Ashland Inc. (US), BASF SE (Germany), DowDuPont (US), JRS Pharma (Germany), DFE Pharma (Germany), Roquette (France), Asahi Kasei Corporation (Japan), Merck KGaA (Germany), Corel Pharma Chem (India), and Avantor Performance Materials, LLC (US). These players are increasingly undertaking mergers and acquisitions, and product launches to develop and introduce new technologies and products in the market. 12.2 Ashland Global Holdings Inc.